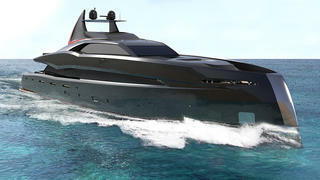 Dutch yard Icon Yachts has signed to build a new 46 metre motor yacht called Project Gotham with broker Harry Bristow-Holmes at Bristow-Holmes. The interior and exterior guest areas are suitably expansive with a vast saloon offering L-shaped seating to port, a bar to starboard, an entertainment centre with state of the art sound and video systems, and a formal dining area forward with seating for 10 guests. The aft deck has built in upholstered seating around two tables and is a layout replicated on the large flybridge, offering guests a multitude of areas to entertain and dine al fresco. Twin 2,000hp MTU diesel engines will give her a cruising speed of 12 knots and a transatlantic range. Project Gotham is scheduled for delivery in Spring 2019.